After logging in, you will see the admin panel; in WordPress, that's called the dashboard. This is where you configure your website and its components and where you write pages and blog articles. The area at the top is called the toolbar. It contains a link to your actual website. The sidebar on the left side of the dashboard contains different sections. From here, you can reach your posts and comments and configure plugins, themes, and the general look of your website. The appearance of your site is influenced by a WordPress theme. The standard theme after installation is called Twenty Thirteen. It comes with a header for the title and tag line of your site, with a menu and a content area (Figure 8). The footer at the bottom of the page should show something like Proudly powered by WordPress. If you choose another theme in the dashboard, you can activate and customize it or simply get a preview. Figure 8: The new WordPress site is getting a new theme. The left sidebar offers some options for customization. If you think this is overwhelming – don't worry. 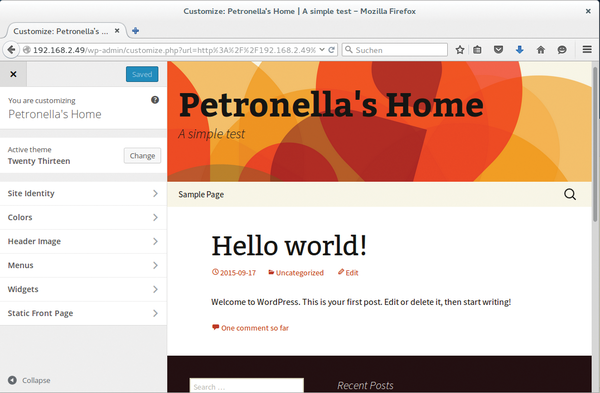 After I set up my first WordPress installation, I played with it for a day, then broke it and started from scratch. So far, your new site is not online on the Internet but is only accessible from your home network, so it's pretty safe to experiment. The WordPress documentation  offers some helpful examples and step-by-step instructions. Have fun with your new site!